Metro Marine Modellers president David Nelson stands next to a model he rigged up of the Cutty Sark, an 1869 tea clipper. The display is part of the Ships Ahoy exhibit now on display at the L&A County Museum and Archives. Photo by Adam Prudhomme. Lennox and Addington County’s Museum and Archives has been transformed into a miniature harbour for the spring and summer as it will house dozens scale boat models during their Ships Ahoy exhibit, April 13-Sept. 6. Toronto-based Metro Marine Modellers Club members have loaned out a handful of their miniature ships for the exhibit, with ships ranging from a 1790s frigate all the way up to models of active vessels. All kinds of ships are featured including the world-famous Bluenose, naval ships, commercial liners and even the Andrea Gail fishing boat, made famous in the film The Perfect Storm. 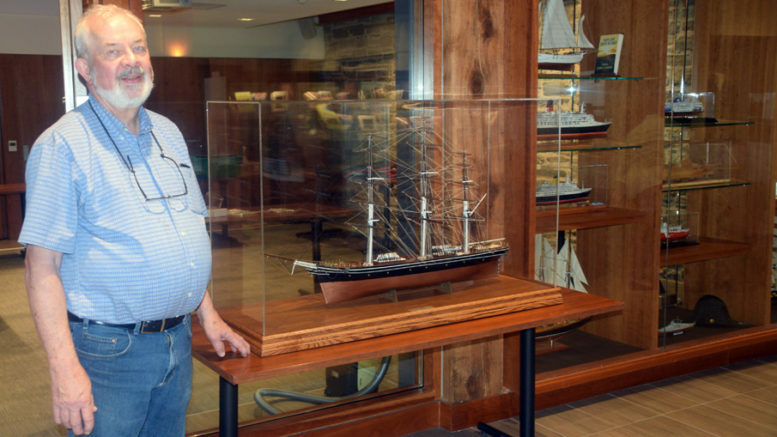 “There’s a lot of history in (the exhibit),” said Metro Marine Modellers president David Nelson, who noted that each ship display would contain the name, dates and a brief history on the vessel. Scales for each of the ships will range as well, with some up to four feet long while others contained inside a tiny glass bottle. He’s also hoping it may inspire the younger generation to want to explore more about ships and maybe take up the hobby of model building as well. Ships Ahoy is the third of the L&A County Museum @ Play series, which encourages people to re-think their notions of a museum and focus on collections, hobbies and traditions. Ships Ahoy also pairs nicely with another exhibit at the museum, which focuses on the history of the Napanee River at St. Lawrence Seaway and the story of the Red Devil speed boat. The museum is located at 97 Thomas St. E in Napanee.